Posted on Wed, Mar 14, 2012 : 6:55 a.m.
With weather like this, even the most cynical of us are forced to admit that spring has sprung in Michigan. This time of year, it’s not just new plays, children’s theater, and world-class tours that are popping up like so many tulips. There is also a spate of season announcements coming soon! I’ve been asked why theaters announce their shows in batches, rather than one at a time, and the answer is simple: season subscriptions. Buying a full season in advance is not only the most economical way to get in on a year’s worth of offerings, it also ensures you don’t miss a thing once schedules get crammed. Because, let’s be honest, in this day and age, when we all have so much on our plates, it’s nice to make sure we don’t miss dessert! Most theaters offer big discounts on their subscription packages, along with priority ticketing, guaranteed seat locations, flexible exchange programs, and other substantial perks. Many have numerous different packages available, tailored to different tastes, and with varying degrees of flexibility in scheduling. Best of all, season subscriptions help support your favorite theaters—making sure they stay healthy and blooming all year long. 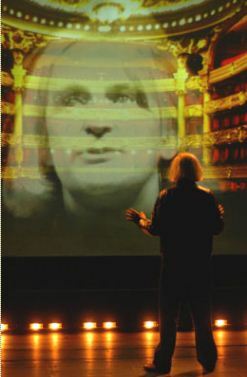 Show: "The Schooling of Bento Bonchev" by Maksym Kurochkin, one-time event, March 16 at 7:30 p.m. Description: A few years into the future, a graduate student named Bento runs out of patience at his typical American university. He no longer wants to study that ancient relic of human behavior called love. He no longer believes it even ever existed. It was just a myth someone dreamed up to market useless products. As Bento breaks with his mentor-professor, shuns the attentions of a young student named Sandy and feels his life falling apart, he sees the world engulfed in a furious sexual revolution and falls into happily married life—all as he strives to just connect. Fun Fact: Maksym Kurochkin is recognized as one of the most imaginative playwrights in Moscow today, “the ideal playwright for the global age,” as Moscow Times critic and translator John Freedman called him. Kurochkin is the recipient of the Boldest Experiment of the Year award from the Moskovsky Komsomolets daily for “Kitchen” and the Russian Anti-Booker award for experimenting with new avenues in drama. Show: “Fabliscious” book and lyrics by Kimberly Yost, music by Patrick Farrell and Gene Gaunt, one-time event, March 17, 1 p.m. Description: Fast! Fun! Fabulous! This multicultural musical will have audiences in stitches. All of the classic fables are here, but with a modern flair. A delightfully entertaining performance that humorously reminds children of the lessons and morals that have been taught for thousands of years. Fun Fact: Performance Network’s Saturday Matinees are followed by a milk (or juice) and cookie reception. Description: The story of a Quebecois songwriter whose encounters in Paris allow him to find out what defines, motivates, and inspires him. Actor Yves Jacques moves between multiple characters in this one-man play, portraying the Quebecois songwriter, a senior manager of the Opera Garnier, a young janitor and graffiti artist of African descent, as well as a dog who could well be guiding the tale along its way. Fun fact: Yves Jacques began his career on comedy television in Quebec, with imitations of famous political figures that became classics and earned him numerous Gemini Awards. Jacques has appeared in a number of films including the 2011 Academy Award Winning picture, The Barbarian Invasions (Best Foreign Language Film). Fun fact: If you’ve never seen the stage play, but are familiar with the 1951 film adaptation, be prepared for a surprise. The very last scene between Stella and Stanley was “Hollywoodified” for the film, and takes a different turn in the stage play, with dramatically different implications for Stella’s future. Show: “The Comedy of Errors” by William Shakespeare, one-time event, March 18, 7 p.m. Description: Shakespeare’s most farcical comedy, and also his smartest. Two sets of estranged twins, each separated at birth, find themselves in the same city 25 years later with hilarious consequences. A series of mistaken identities, assumed personas, and wild mishaps bring a family crisis into heartwarming focus. For this production, UK comedian and actor Lenny Henry makes his National Theatre debut as Antipholus of Syracuse. Fun fact: National Theatre Live performances are filmed live in high definition and broadcast via satellite to over 300 cinemas around the world, live in Europe and some US cities, and time-delayed in countries further afield. There are over 75 venues in the UK alongside venues in the USA, Canada, Australia, South Africa, Scandinavia, and Europe. Venue/location: Towsley Auditorium, Morris Lawrence Building, Washtenaw Community College, Ann Arbor. Description: This exciting sailing story, set in 1893, follows the travails of twelve-year old Aaron Buchanan when his family's schooner is caught in a fierce storm. As the family returns from Sault St. Marie on Lake Huron in November with a huge load of Christmas trees, they are caught in a ferocious gale that sweeps through Thunder Bay—infamously known as Shipwreck Alley. With the help of the lighthouse keepers on Thunder Bay Island, a crew from the lifesaving station brave 40 knot winds and sixteen foot waves to effect a daring rescue. Fun fact: This historically based, original drama has been written by long time Wild Swan playwright Jeff Duncan. Award-winning musician David Mosher has composed original music as well as a soundscape of authentic sounds--timbers creaking, waves crashing, and winds howling. Description: Pop vocal music, and quick witted humor give Three Men and a Tenor a unique style of performance developed over their 20 years together. A polished experience for all audiences takes you on a roller-coaster ride of musical eras. While the name suggests a classical or jazz repertoire, "Three Men and a Tenor" sings entirely pop music, classic rock, country, Motown and standards. Fun fact: Three Men and a Tenor have been together for over 20 years! Show: “The House at Pooh Corner” one-time event, March 19, 1:30 p.m. Description: Every so often each of us has to "get back to the House at Pooh Corner" to spend some time with devoted friends. Faithfully based on the A.A. Milne classic book, this musical production features stories about the building of Eeyore's house, Tigger's arrival in the Hundred Acre Wood, Rabbit's plan for reducing Tigger's bounce, and Christopher Robin's growing up and leaving for school. Fun Fact: Christopher Robin Milne was the son of author Alan Alexander (A.A.) Milne and Dorothy Milne. On his first birthday, he received an Alpha Farnell teddy bear he called Edward. This bear, along with a real bear named "Winnie” that Milne saw at the London Zoo, eventually became the inspiration for the character of Winnie-the-Pooh. The teddy bear was about two feet tall, light in color, frequently losing his eyes, and a fairly constant companion to Milne. Description: Broadway’s master of comedy, Neil Simon, expertly weaves a variety of Anton Chekhov short stories into a laugh-out-loud evening that is heartwarming, hilarious, and just what the doctor ordered. The series of vignettes explores the humor, pathos, and utter humanity of ordinary characters caught in ordinary—and extraordinary—circumstances. Fun fact: Neil Simon is considered the world’s most successful playwright, with more Academy and Tony Award nominations than any other writer. Fun fact: While the story of “Big Nose George,” a cattle rustler whose skin was turned into shoes after his hanging, is merely the back story in this Wild West play (that is, it has already happened when the play begins) audiences have become fascinated by the incident. The shoes themselves are on permanent display at the Carbon County Museum in Rawlins, Wyoming. Fun fact: The festival kicks off with A Playwright’s Roundtable: Playwrights and the Collaborative Process on Sunday, March 18 at 8 p.m. TNTP will welcome playwrights Annie Martin, Michael Brian Ogden, Jeffery Allen Steiger, Audra Lord, and TNTP’s own Playwright-in-Residence Jason Sebacher.